Renovating your house is always exciting and if you take the initiative then nothing can be more exciting than this. Plus, it’s always move, as you would always be saving a lot of money on mechanics and all. The DIY (do-it-yourself) project is always a smart choice, provided you know the basic technicalities involved in your renovation process. After coming up with a blueprint, the next thing is to gather necessary building materials, such as eye bolts & eye screws. You should first of all know what your basic building material requirements before initiating the renovation task. There are certain tools and hardware supplies, which help you make your ask easier and faster. Those devices are specially designed to enable an anchor into steel deck, brick, concrete, stone, wallboard and wooden panels. An eye bolt looks like a lollipop. While one end of the bolt looks like the threaded end of a screw, the other end is round in shape. The threaded ends are part of the bolts, featuring slanted ridges. These metal pieces are used to fix cables, wires, strings or chains to any surface or objects. For instance, they can be fixed into the ceiling to support plumbing pipes. Besides, these are also used to support wall hangings, light fixtures and other decorative items. 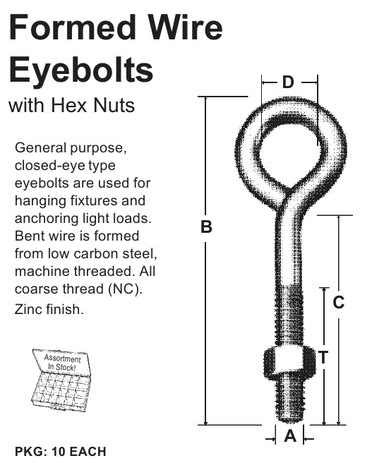 Usually there are two types of eye bolts: welded and forged. A welded one has got closed ‘eye’, fixed to the base, while the forged one has got an ‘eye’ that forms a semi-closed loop. This kind of fastener is a round pin used to fix two objects with each other. It is mainly used to manufacture curtain rods or racks. It is available in various sizes and designs. However, the wooden ones are the most commonly used fasteners, as these are used in wooden pieces to strengthen the joints. Depending upon your requirement, you can select from a wide range of available fasteners. When you have got something to fix or any household task to do then you must be sure that you have got the appropriate tools. 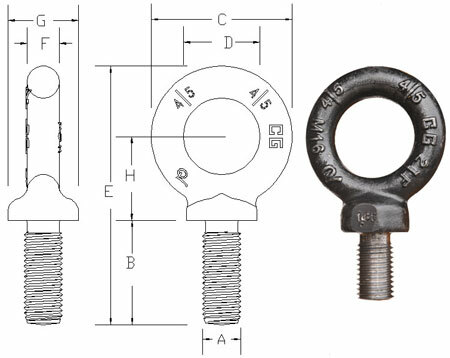 If your supply needs require an eye bolt then you should also be certain that you’ve fetched the right model. Here’s a quick breakdown. Do have a read! 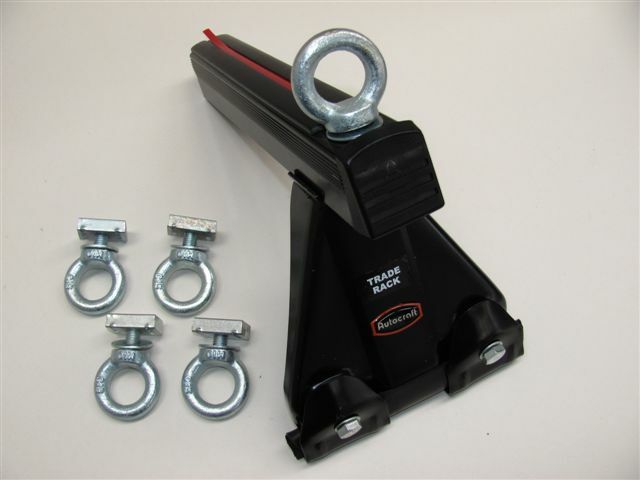 If you’re doing a straight line pull then you’ll need a regular size of a lifting eye bolt. This would be in fact the anchor point so as to fasten a wire pipe and any appropriate geared apparatus, which is attached to the end point. The galvanized stainless steel object enables less corrosion on the bolt, which could have affected the vigor and durability of the metal object. 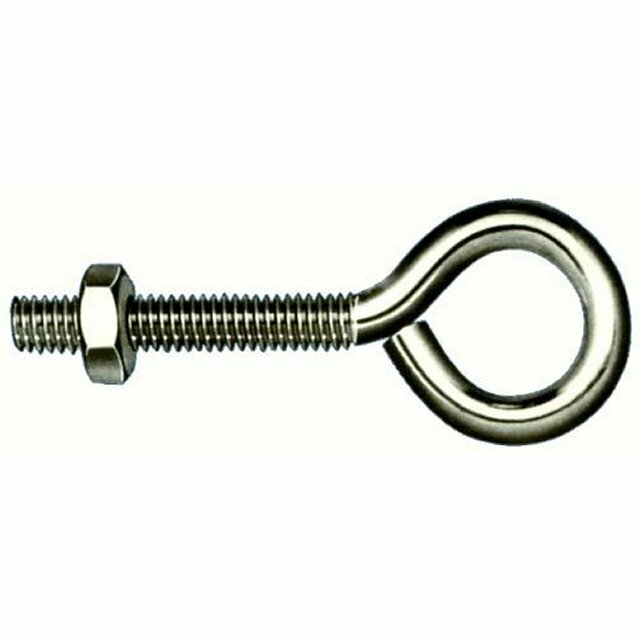 You should always look for an eye bolt that is made up of stainless steel and is welded from marine grade steel, so that it can easily withstand any kind of environs, be it harsh, wet or humid. The welding of the bolt enables it to be used as a heavy duty ballast point. However, if it’s used on commercial purpose then the manufacturer should always consider the working load limits. If you are required to do any kind of angular lifting then you should always go for a shoulder eye bolt, so as to safely execute the task. The shoulder bolt is actually a ‘collar’ type present between the shank and the eye. This helps maintain the durability and strength of the bolts. When you are doing an angular lifting then always be sure to go through the user manual, regarding placement of the bolt, washers and threading for maximum output. However, you can go for bolts, which are not welded, if you will be doing any lighter duty task. Such stainless steel eye bolts are usually made up of marine grade steel and is quite resistant. This is also cheaper anchor point and it’s mandatory to always go through the instruction manual before using this light-weighed object. The regular bolts can always be tailored made as per the client’s requirement and suiting the environmental conditions of their jobs. 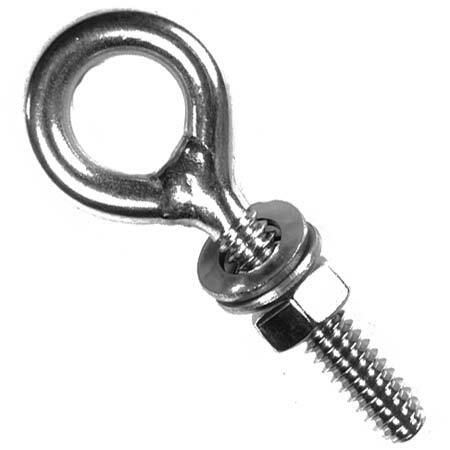 The drop forged eye bolts are 316 stainless steel type fasteners and are usually available in 1/4″ x 2″ size. Although there are other sizes available in the market, eye bolts shown here are supplied standard rivets enabled flaunting a hot galvanized finish. Before being galvanized, these are threaded national course and are equipped with hex nuts, which are tapped oversize to render easy galvanizing thickness. Not to mention, these rivets are usually without a shoulder and are also available along-with special shank and customized thread sizes. 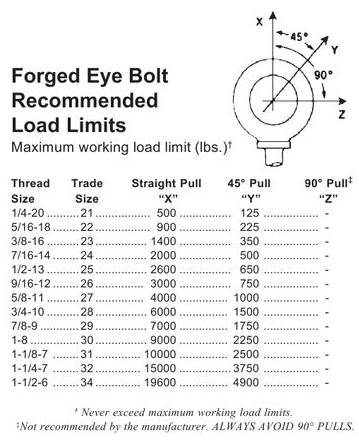 Loads applied on drop forged eye bolts are usually based on a safety factor ranging from 5 to 1. When tested, these particular eye bolts get pulled with a direct tension at a uniform rate of speed. Any aberrations such as shock loads, angular lifts, modifications of the basic forging etc. result in dramatically reduced maximum loads. The drop forging is a type of metalwork process, which helps in gradually shaping a heated piece of metal, known as ingot. This technique involves creation of ingot, by giving repeated blows from a hammer or a die. This is done by raising and then dropping the hammer on the metal piece, thereby either flattening it or molding it to a desired shape. Determining the intricacy of the required design, the procedure sometimes involves numerous dies and other steps as well. The drop forged eye bolts are usually produced with a close approximation of the finished metal piece. In some cases, some additional method, such as machining is involved, so as to obtain the required tolerance. It is a type of manufacturing process, which is used to create objects out of metal. Click here to know more. The drop forged eye bolts are used extensively in the automotive industry in producing various engine parts, gears and axles. The dies used in this method are typically made up of high alloy steel known as tool steel. Such dies are designed specifically to become resistant to daily wear and tear. These are also capable of withstanding repetitive rapid heating and cooling cycles. The dies used in this technique are made into two halves. While the upper half, known as hammer, is fastened to the raised block, that is dropped into the ingot; the lower half, known as anvil, is a rather stationary die used against the ingot, that is forged. Another commonly used drop forging method is the open-die type. In this method, the dies do not completely encircles the work-piece. This kind of die is usually flat unlike contoured dies and cutting dies and are far more superior than the normal dies. This kind of open design accounts room for the expansion of the ingot, when it is hammered to the desired thickness. 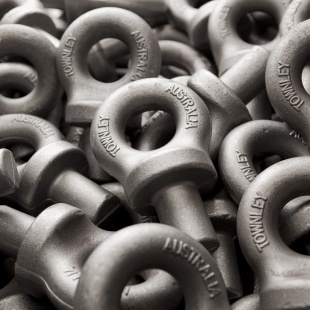 The drop forged eye bolts are also prepared under various other techniques such as cogging and edging, impression-die forging and closed-die forging known as flash-less forging. These rivets, which are available in steel and C-1023 type, are usually supplied standard fasteners featuring a hot galvanized finish. Before being exposed to galvanizing, they are threaded and enabled with hex nuts tapped unshapely, which assist in galvanizing thickness. 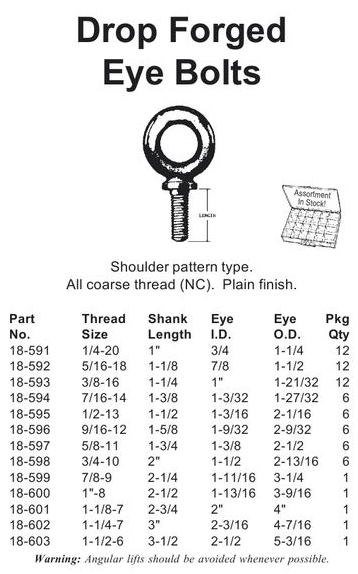 Special shank and thread sizes for these rivets are also available in the market. As per your requirements, you can choose accordingly. For these fasteners, loads are applied on a safety factor from 5 to 1. When tested, all such eye bolts are easily pulled at a uniform rate of speed in a direct tension. However, be warned that any kind of deviations, including shock loads, angular lifts, modifications of the basic forging etc. will result in dramatically reduced maximum loads.